We stand looking out over a desolate landscape of white sand and low, stunted shrubs. Nothing moves except for the small bushes which are stirred by a hot wind that sweeps and moans across this desert. Du forventer et halvt løve eller en giraff til å gå inn i visningen, eller for den ensomme rytter å ri opp på en tørst og utmattet hest. But this is not the desert savannah of Africa or the plains of the western US. It’s Lamandau River Wildlife Reserve, Central Kalimantan on the island of Borneo, more associated with lush tropical rain forest, than arid desert scrub. And of course this was once a green tropical paradise, vibrant with plant-life, animals, insects and birds. 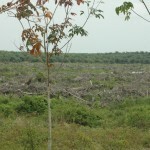 Until, that is, the loggers came, to clear-cut the forest for the timber that we crave, and apparently can’t do without. That was many years ago, and since then this huge area has lain dormant, and unused. An ugly scar on the face of the earth. Under Indonesian law, loggerne er pålagt å plante trær som de har kuttet, men dette er lett omgått, often by closing the original company, and starting anew somewhere else in the forests. Based on the success of FNPF (Friends of the National Parks Foundation) reforestation projects in other parts of Central Kalimantan, Bayu and his team have been invited by the local government to open a centre here in Lamandau, to start the process of re-greening the desert. 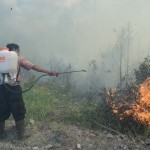 Vi var på en 4-dagers besøk for å se på fremdriften av FNPF innsats for å plante trær her i Central Kalimantan, i områder nær Tanjung Putting National Park. The team includes FNPF Director and Founder Bayu Wirayudha; Michael Kennedy, Director and Co-Founder of HSI Australia (Humane Society International Australia), a key FNPF donor, og Lily Wardoyo, an FNPF Ubud volunteer. 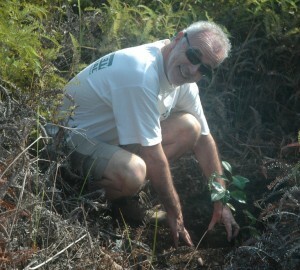 FNPF has several replanting sites near the Tanjung Putting National Park. The oldest of these is at Pesalat, hvor FNPF har vært opptatt med planting Stiklinger for fortiden 7 år. Resultatene er hjertevarmende, og spektakulær. On our recent visit a flock of black hornbills crossed the young forest, and other bird species flitted from tree to tree. 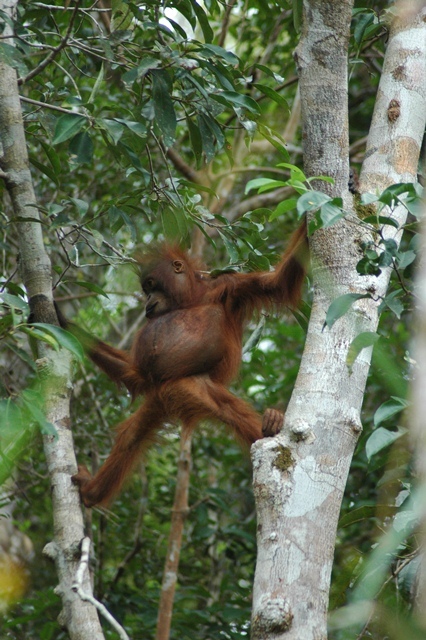 The Pesalat forest is also home to deer and pigs, and other animals, and most exciting of all, orangutan, som kommer hit for å mate på frukt fra plantet trær. Bayu viste oss restene av frukt spist av orangutang, og forklarte at de føler seg trygge å gå inn i nyplanting sonen, even though they must spend some time on the ground as they traverse the forest. 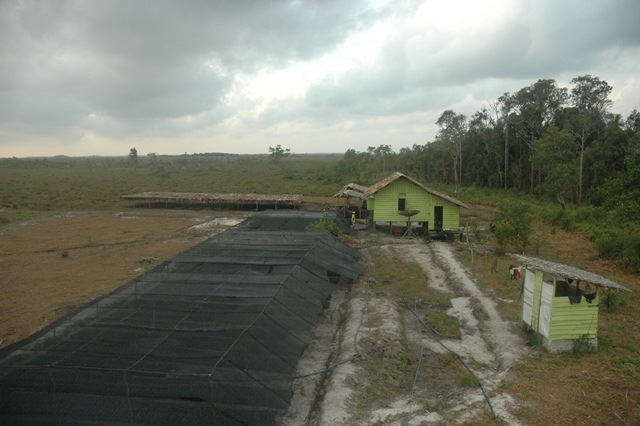 As with other FNPF sites in Kalimantan, there is an office with accommodation for workers and volunteers. The one at Pesalat is particularly pleasant, surrounded by shady trees, and a nursery for saplings of many different tree species. 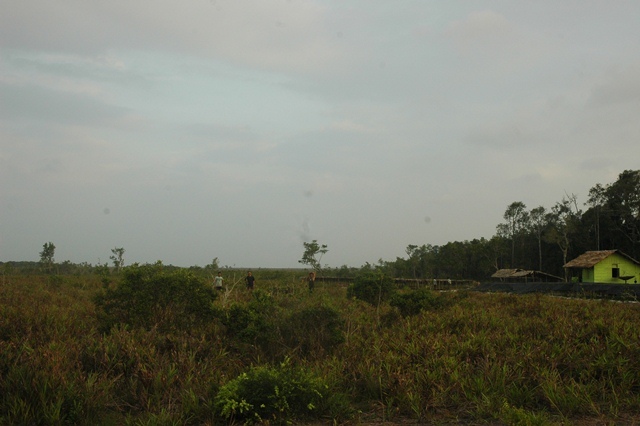 FNPF has other replanting sites at Beguruh, where you can climb a fire-watching tower to view the developing replanted forest below, og Padang Sembilan, a newer site in an area of former farming and rice-growing fields, where the tiny saplings must compete with ferns and other vegetation that makes this a particularly challenging replanting task. På Jerumbun, FNPF er oppmuntrende ansatte og lokale landsbyboere til å eksperimentere med agro-skogbruk avlinger, slik som gummi, gaharu and watermelons. This area buffers the river from a large palm-oil plantation, and the day before our visit, en brann hadde sett FNPF ansatte rushing å vurdere eventuelle skader, og for å være klar til å kjempe mot flammene, eventuelt. Fores t fires, some set deliberately, particular ly near p alm-oil plantations, are a constant source of worry for FNPF. 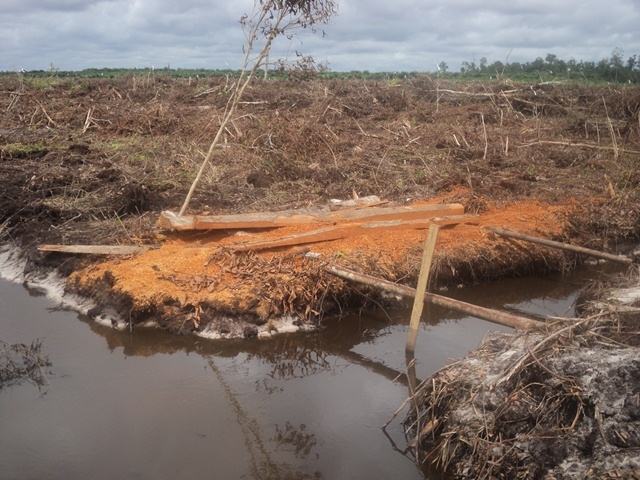 Several developi ng forest areas have been damaged by fires, and it is heartbreaking for FNPF workers to see trees that they have nurtured for years, destroyed in the blink of an eye. A young orangutan was spotted at Jerumbun during our visit, but he quickly fled into the nearby forest. 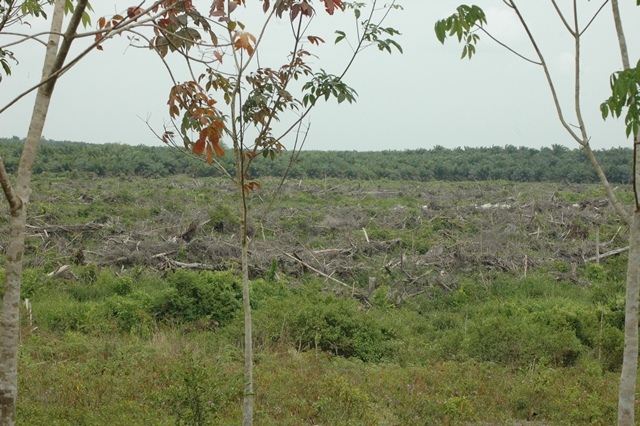 The potential conflict between man and orangutan was illustrated graphically by the sight of young rubber trees, planted as cash-crops by villagers, where the bark had been chewed off by the animals. 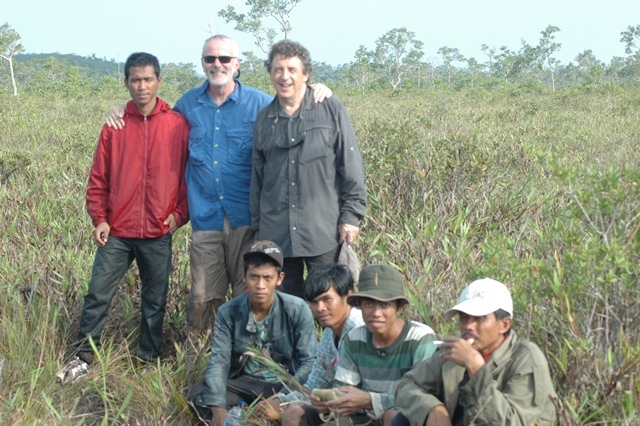 All of the replanting work carried out by FNPF has resulted in a substantial body of knowledge about how best to carry out this important work, og ånden av eksperimentering har tilført arbeidet med Bayu og hans teamet. De vet nå de beste treslag for ulike jord, climate and vegetation conditions; the optimal interval to leave between saplings and other vegetation; the best season to plant, og så videre. 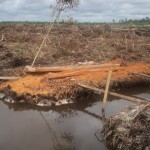 Som med alle areal problemet, skjønt, det er rikelig potensielle konflikter med de ulike interessentene, and in Central Kalimantan they include the local communities, palm-oil companies, logging both legal and illegal, gold miners, the local government, and even other NGO’s. It is vital that these various stakeholders support, or at least do not hinder, the work of FNPF. At the nearby village of Tanjung Harapan we visited a small house that will be used as a library for the village children to learn about their environment, and the importance of preserving the local forests. FNPF is also supporting village ecotourism and agroforestry initiatives in Tanjung Harapan, encouraging the development of livelihoods that do not depend, like logging and gold-mining, on the unsustainable exploitation of local resources. Back at Lamandau, the task is particularly challenging. Not only is the destroyed area a large one, but the soil, and climatic conditions are unfavourable. The soil in many places is simply white sand. FNPF have made a great start, however. The office and centre nestles in the lee of a sliver of surviving forest, which holds an all-important water supply, rare in this area. 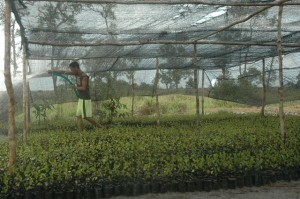 Replanting has already started, and tiny saplings reach for the sky around the FNPF center. 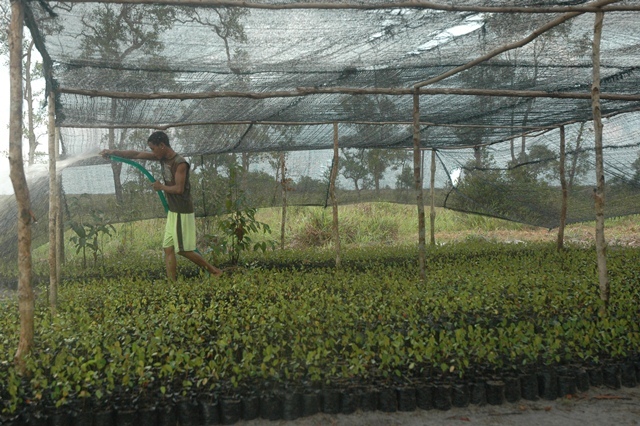 Experimentation by the FNPF team has shown that saplings grafted from larger trees grow quicker, and are stronger once planted, and this promises to speed up the planting process. It is hard, now, to see this blighted land being transformed into a sea of green. But with the willpower and experience of Bayu and his FNPF team, and the support of generous and far-sighted donors, such as Humane Society International, The Boeing Corporation and Taronga Zoo, the vision will become reality. As Michael Kennedy of HSI said after his recent visit, “Skogen rehabiliteringsarbeid av FNPF er virkelig inspirerende. Their commitment to protecting Tanjung Puting National Park is second to none, og vi er meget stolte av å bli assosiert med deres pågående bevarings prestasjoner. " 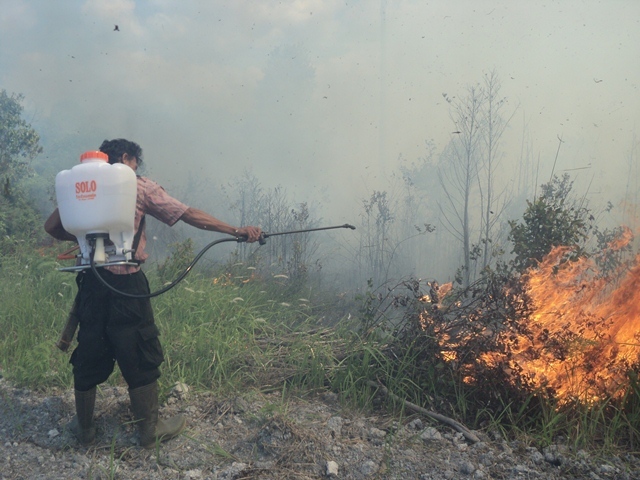 Forest fires, some set deliberately, particularly near palm-oil plantations, are a constant source of worry for FNPF. Several developing forest areas have been damaged by fires, og det er hjerteskjærende for FNPF arbeidere å se trær som de har oppfostret i årevis, destroyed in the blink of an eye.